At Lairds Interiors, we pride ourselves on great service and listening to our Clients' needs. We have been in the Interior Design business in the UK since 1993 and in Canada since 2006. We will listen to your needs, give you lots of options and together decide on your new design. Our knowledge will help you turn your house into a beautiful home. We can do as much or as little as you require. Our service is friendly, relaxed and professional. Whether you are looking for cottage-style, sophistication or contemporary designs, we can help. No matter which window or room, we will have the perfect solution for you. No job is never too big or too small. We can advise on all your interior needs and keep within your budget. We can transform any room you choose into that beautiful space you desire. We carry thousands of samples and can carry them directly to your door. 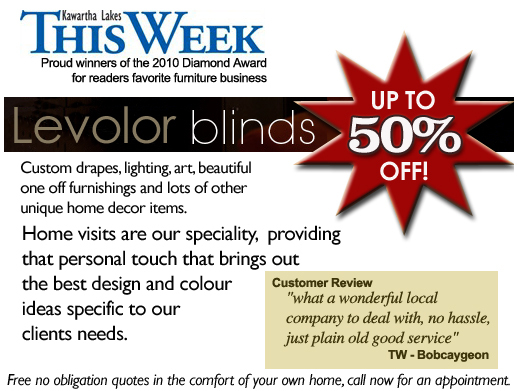 Let us show you our selection of custom made Levolor Blinds with hundreds of colour choices. Ask us also, how you can save money on our exclusive Energy ShieldTM cellular blinds. If it's a renovation you need, we can manage your project from start to finish and oversee all aspects of the design. Our attention to detail is second to none, so let us help.